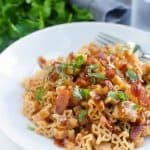 One Pot Cheesy Barbecue Chicken Pasta – easy weeknight dinner recipe, ready in less than 30 minutes! 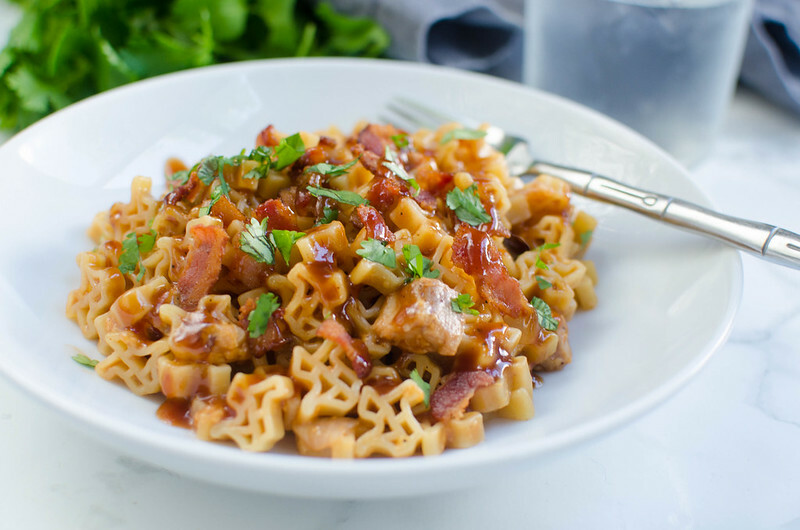 Everything your family loves: pasta, bacon, cheese, and barbecue sauce! 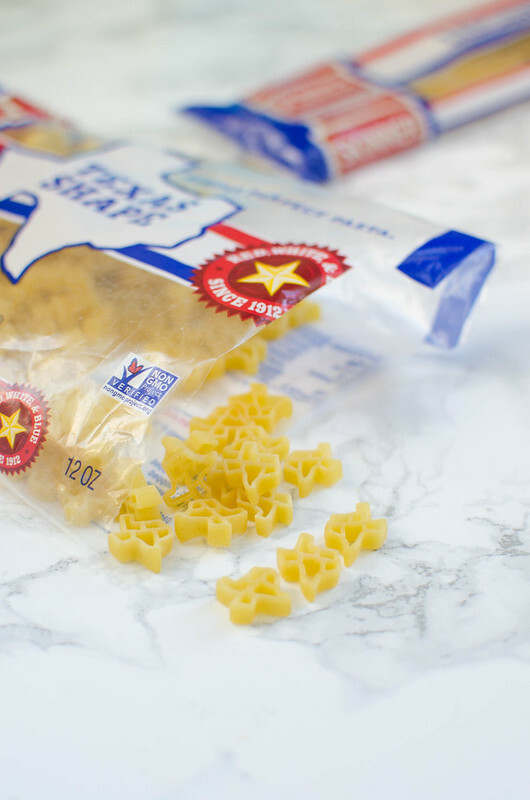 Back in the summer, I did an Instagram post for this same pasta, my favorite pasta ever, Skinner® Texas Shape pasta and I have been obsessed with it ever since. If I invite you over for spaghetti and meatballs, what I mean is Skinner Texas Shape pasta and meatballs. Baked ziti? Baked Skinner Texas Shape pasta. Macaroni and Cheese? Okay, you get it. But yeah, I’d literally bought a bag of this pasta the day I got the cutest package from Skinner for this post (thanks for sponsoring!). I Instagram story’d it but I guess I didn’t screenshot it, which probably means you should follow me over there to keep up with all my Texas-shaped pasta dishes. So why am I obsessed with it? Besides the fact that it is shaped like Texas? It’s great tasting, easy to cook (this shape literally takes 7 minutes), non-GMO, and incredibly budget-friendly. They also have the usual pasta shapes like spaghetti and elbows and penne if you’re into that sort of thing. Also, Skinner Pasta is based in Houston and donated 37,000 servings of pasta to the Houston Food Bank after Hurricane Harvey. They also set up a food truck and traveled to the areas of Houston devastated by the flooding to serve free hot meals to those affected. And Texas loves Skinner as much as they love Texas, which is why Skinner is the number 1 pasta brand in the state. As I said, I’m making a lot of pasta these days. It’s quick, easy on the wallet, and I know my boys will eat it without complaints. 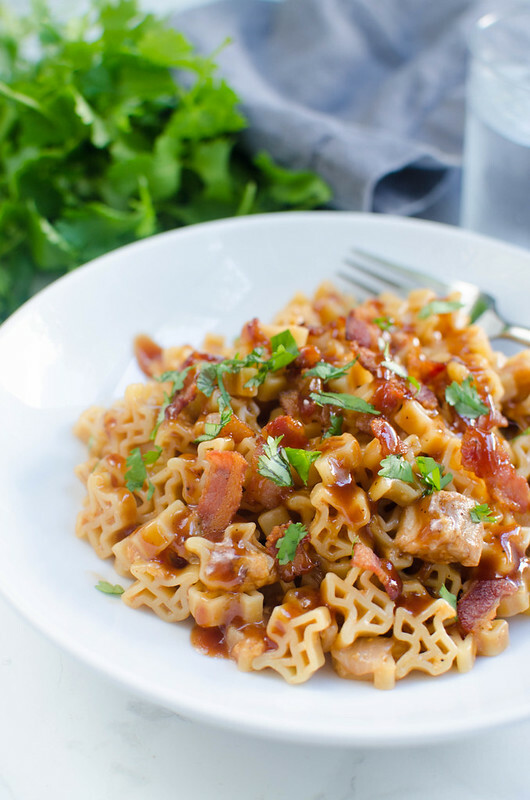 My oldest has after-school activities 5 days a week now, which means I’m coming home at 6 pm and throwing together something quick, like this One Pot Cheesy Barbecue Chicken Pasta. I’m always skeptical of a one-pot meal because sometimes the pasta just doesn’t turn out, but I find the Skinner pasta cooks perfectly. Seven minutes for this shape, but check the packaging for instructions on other shapes. If you don’t want to use the Texas shape for this recipe, you could totally go for elbows or penne. 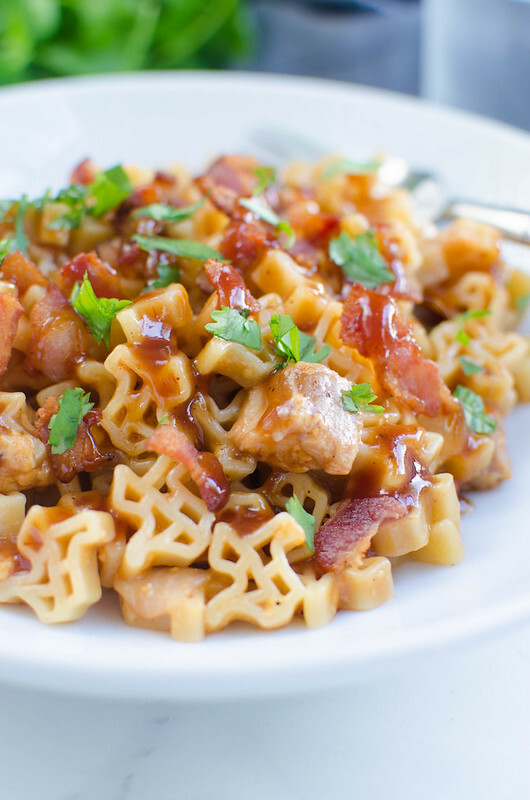 The whole thing takes less than 30 minutes and it has everything my boys love: pasta, bacon, barbecue sauce, and cheese! In a large pot, cook bacon over medium-high heat until crisp. Use a slotted spoon to transfer to a paper towel-lined plate. Set aside. Pour off all but about 1 tablespoon of bacon fat. Add onion and cook until softened, about 5 minutes, stirring frequently. Add garlic and cook until just fragrant, about 30 seconds. Add pasta and chicken broth; bring to a boil. Cover and cook 7 minutes. Remove from heat and add ¼ cup barbecue sauce and the cheese. Stir until cheese is melted. Drizzle with remaining barbecue sauce and sprinkle with cilantro before serving.